Macri defeated outgoing President Cristina Fernandez de Kircher’s handpicked successor Daniel Scioli in a historic runoff election less than three weeks ago. Today, Macri braced Congress, where Fernandez’s party maintains the majority, for large-scale reforms regarding the judicial system, education, drug trafficking, labor and corruption. “I want to be the president of labor, solutions and a united Argentina,” he later said. 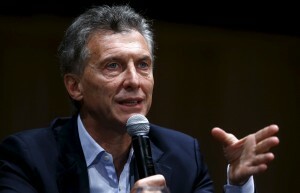 But Macri offered few details on how he plans to create economic growth and address the country’s foreign debt crisis while lifting currency controls and holding off impending devaluation of the Argentine peso. Thousands of supporters cheered as Macri danced on the Casa Rosada presidential palace balcony, accompanied by his wife and daughter, while Fernandez boycotted the ceremony. She instead held a farewell rally in her home province Rio Gallegos. Macri’s ousting of Fernandez’s leftist party comes as left wing politics are losing political ground in the region. Brazil’s leftist President Dilma Rousseff faces impeachment regarding her involvement in the country’s state-run petroleum company Petrobras. Chavez’s predecessor President Nicolas Maduro and his socialist party just lost their majority in Venezuela. And while the cornerstone of South America’s left wing politics has been to rally against U.S. intervention, Cuba’s President Raul Castro agreed to the normalization of diplomatic ties with the U.S. after more than five decades of Cold War animosity.